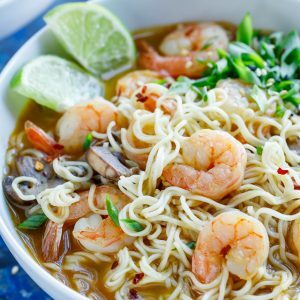 This piping hot Sriracha Shrimp Ramen Noodle Soup is quick, easy, and crazy delicious! Thaw shrimp if using frozen. If you can, buy cleaned tail-on shrimp and keep the tail on for extra flavor for your broth. It basically turns vegetable broth into a seafood stock of sorts and is totally optional but totally tasty! You'll remove the peel/tail before diving in. In a medium pot over medium-high heat, add a teaspoon of oil and sauté your shallot and mushrooms. Once golden and tender, remove the veggies (set aside on a plate) and add a quart of broth to your pot. Bring broth to a boil and cook ramen noodles per package instructions. When you have about a minute left on the noodle's cook time, add soy sauce, Sriracha, and shrimp to the pot. Stir in your lime juice. Give the broth a little taste and further season if/as desired. Extra Sriracha will add heat while extra soy sauce will add saltiness and umami. Use tongs to divide your ramen between to 2 bowls. Repeat for your sautéed veggies. Pour the broth and shrimp over each bowl and top with lime wedges, green onion, sesame seeds and all your favorite toppings from the list above. Enjoy while it's hot! Add as much extra shrimp and mushrooms as your heart desires. The recipe above has lunch-appropriate serving sizes but if you need a big ole filling dinner, load it up! This dish is crazy flexible like that. No shallots? No problem! You could also use minced garlic in place of the shallots, just adjust the amount based on garlic preference. I'd use maybe 1-2 cloves max. Nutrition Facts below are estimated using an online recipe nutrition calculator. Adjust as needed based on toppings and extras and enjoy!